I have had a difficult time in preparing the following article whether is was due to lack of ‘time’, concentrating on the actual delivery and writing of the content, or simply old fashion laziness, I decided I needed to complete it before I started articles of other matters. In my recent quest of becoming a clock collector, and researching the history of the nearly two dozen clocks that have come home with me, I reminded myself that somewhere in my readings and research on other subjects, there was once a clock maker in Kittanning. It didn’t take any real amount of time to locate John Clugston, the individual who built the clocks. 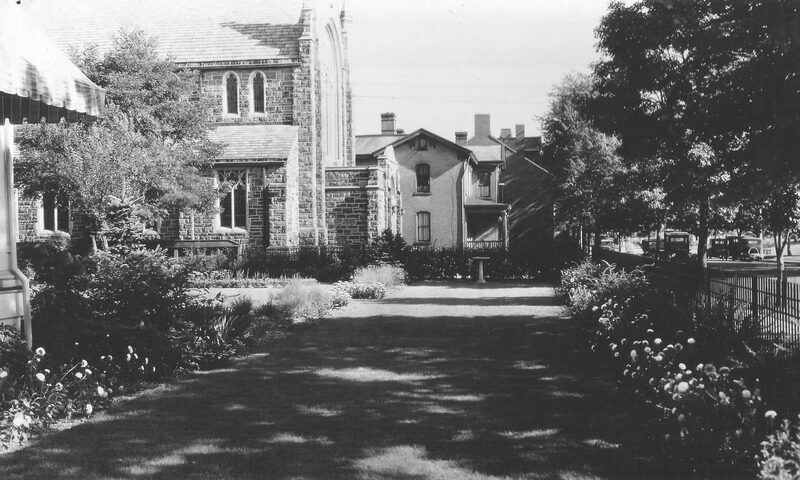 This little afternoon curiosity, quickly turned into a quest to learn more about this seemingly obscure piece of Kittanning history. This frame building is believed to be John Clugston’s clock store. On June 21, 1828 in an ad taken out of the Columbian, a newspaper published in Kittanning, that he had “commenced the manufacture of eight-day and thirty-hour brass clocks, in the frame building next door to Thomas Blair’s office,..” This was located on lot No. 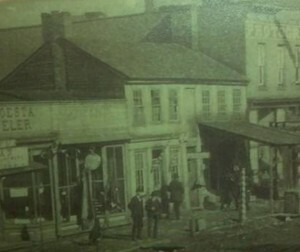 122, on the north side of Market, a little above Jefferson street, and opposite the old Register’s office. It was quickly learned that Clugston never built and of his thirty-hour clocks, and only completed and sold five of the eight-day clocks. These five clocks that were made cost in around the $40 mark and were made of the finest materials available at that time. 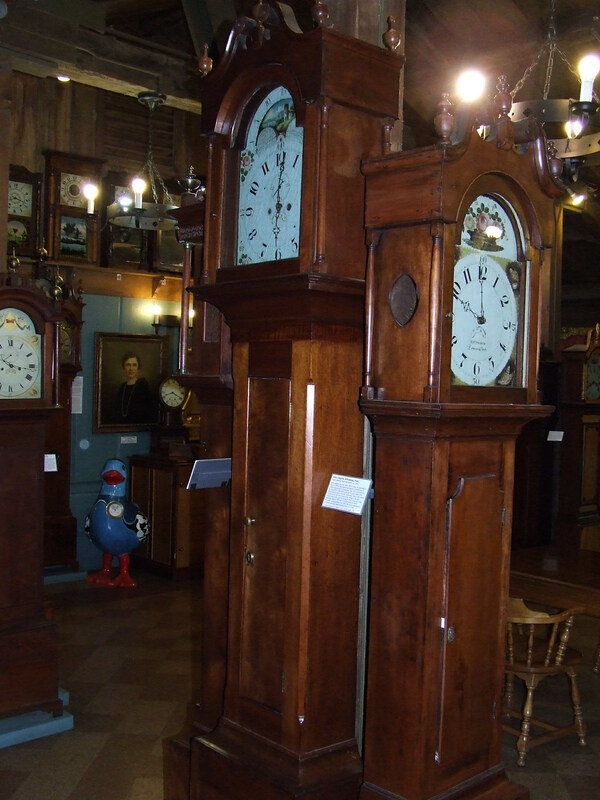 One of the clocks was purchased by John Mechling, which later was purchased by J. E. Brown. Another clock was sold to James McCullough Sr., one by Mr. James Montieth, another to James Matthews and finally one to David Reynolds, owner of the Kittanning Inn. Mr. Clugston carefully constructed, polished and fitted each intricate part into creating these clocks. They also included attachments which indicated the day of the month and the current moon phase. 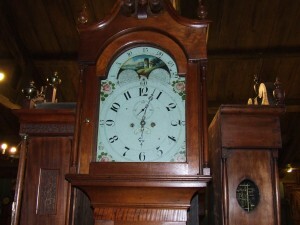 The clock owned by James Montieth, who was a charter member of the First Presbyterian Church, trustee of the Kittanning Academy in 1821 and operated a store in the 1820’s on Market, would become the property of his daughter, Mrs. Nancy Gilpin, whose husband, Dr. John Gilpin, moved the clock to Elkton in Cecil County, Maryland after his wife’s death. This clock originally stood in the mansion on Jacob’s Hill, built by Dr. Gilpin. After Dr. Gilpin passed away the clock was owned by his second wife, Olive Gilpin. Upon her death the clock was brought back to Kittanning by Mary Elizabeth Adele Gilpin McCain, the great granddaughter of the original owner, James Montieth. Jim McClister, and attorney from Kittanning once found McCain standing on a chair to wind the clock. He happily volunteered to the task of winding the clock every Sunday over the next several years. Mr. McClister remarked that the clock was quite tall and was very handsome with beautiful veneer, and that it kept great time. The clock that was purchased by David Reynolds, was perhaps the best known of all five built by Clugston. This clock was placed in the Kittanning Inn, and it was that clock that became the official time for all business conducted at the Armstrong County Courthouse. Each day the county crier would transverse the Market and Jefferson Street intersection from the courthouse to the Kittanning Inn and find the ‘official’ time before returning for the start of each days court. This clock eventually fell into disrepair and wasn’t kept running. The clock remained in the Reynolds family until the great-grandson of David Reynolds sold it to Dr. Douglas and Mrs. Caroline Shaffer. Dr. Shaffer, a horologist, was at one time President of the National Association of Watch and Clock Collectors. 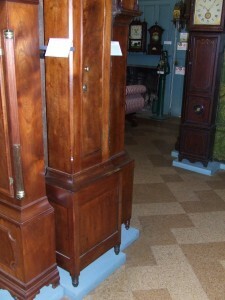 In 1984, the Shaffer’s donated the Clugston clock to the American Clock and Watch Museum in Bristol, Connecticut. This clock which is made from walnut and tiger maple rises at 8’ 11″ tall, and stands as a testament to the craftsmanship of John Clugston. The Clugston clock that was purchased by David Reynolds stood for many years in his Kittanning Inn and later in the Reynolds Hotel. 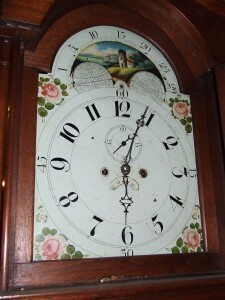 The dial on the Clugston clock owned by David Reynolds is thought to be made by Philadelphian, William Jones. Mr. Clugston who was believed to be born in Kittanning about 1802 only remained in Kittanning until sometime just before 1840,when he moved his family to Portsmouth, OH. There, he went from being a tall case clock maker to a watch maker. His wife, Caroline, passed away in 1858. Mr. Clugston then virtually vanishes and it is only known that he is buried in a cemetery in Calhoun County, Illinois near where his son William lived. It is my desire to continue research on the remaining four Clugston clocks to see if any have survived the past 180 years. My clock and Kittanning memorabilia collections would be near complete with a Clugston clock in it!!! The long walnut case from the Clugston clock now stands with many other great clocks at the American Watch and Clock Museum in Bristol, CT.
page 303, 1830 Census of Kittanning Borough, Armstrong County, Pennsylvania. page 89, 1840 Census of Portsmouth, Scioto County, Ohio. page 198, 1850 Census of Portsmouth, Scioto County, Ohio. page 367, 1860 Census of Portor Township, Scioto County, Ohio. History of Armstrong County, Pennsylvania, Robert Walker Smith, Esq., Waterman & Watkins & Co., Chicago, Il, 1883. Forum board of the National Association of Watch and Clock Collectors. Clugston clock pictures courtesy of the American Clock and Watch Museum, Mr. Thomas Manning, Curator.